This model has been discontinued. 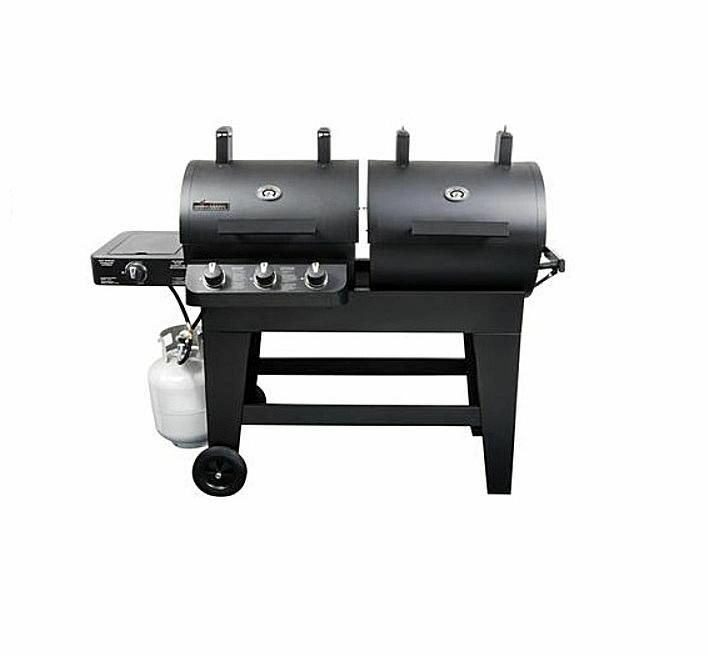 It is replaced by the Brinkmann Dual Zone Charcoal Gas Grill Model# 810-6340-S.
Over the years, several companies have attempted to blend the convenience of gas with the flavor of charcoal. Recently there has been a few side by side grills. Basically, this version is two grills, one gas and one charcoal mounted together on a single cart. Add in a side burner, albeit a weak one and you have what would appear to be a complete package, and all for about $300USD. Sound too good to be true? Well, it should. The real question is, do you really need this 5 foot long, 120 pound all in one grill or would you be better served with separate grills. The truth is that this grill isn't that well built. This gas/charcoal dual grill is almost an exact copy of the Char-Griller Duo that sells at Lowe's Home Improvement Stores. Obviously, Home Depot felt they were missing something so they got Brinkmann to make this grill to the almost exact specifications. This Brinkmann model at Home Depot is such a blatant knockoff of the Char-Griller Duo sold at Lowe's that you would think it would be too embarrassing to put out on the showroom floor. Since the competition between Home Depot and Lowe's is so tight it would appear that they have to carry the same products, for the same price, but from different companies. The person who buys this grill probably didn't do their research and most likely bought it on impulse. The gas grill side is a 36,00 BTU 3-burner gas grill with medium weight porcelain coated cast iron cooking grates and a low powered, 10,000 BTU side burner. While some of these components are not the best quality they are not necessarily that bad for the price. The BTU output is low for the size (the Char-Griller version has 40,800 BTUs), but the barrel shape and thicker steel body holds in heat well enough to give you some good grilling power. Other than this, it is a typical low cost gas grill. On the charcoal side, you get a typical barrel-shaped charcoal grill. The cast iron cooking grates are good for heat transfer and the dual layer bottom holds in the heat and protects the painted finish. While relatively small this charcoal grill gives you enough room for many grilling tasks but is limited in indirect grilling space. The questions you should be asking yourself is do you really need both a charcoal and a gas grill and if you do would it make more sense to buy one of each separately. After all, if the gas components of this grill rust out and make that side useless you have a 5-foot long charcoal grill with a limited cooking area. My recommendation would be to purchase a Weber Charcoal Grill for around $100 that will last you a good decade and perhaps a lower end Char-Broil Gas Grill for around $150 that will last a few years.